Regardless of who the Anaheim Ducks play on a game-to-game basis, they shouldn’t just judge a book by its cover. There have been many instances this season where they should have won. But letting go of the gas pedal in the best hockey league in the world is a major brain fart. And at this point of the season, it’s not going to get easier. Games are going to get more physical and meaningful with play-offs on the horizon. They will play their second game in 24 hours, this time against the Tampa Bay Lightning. Per OC Register’s Eric Stephens, Sami Vatanen will be a game-time decision. He was hurt alongside the boards during last night’s game. Vatanen is second on average time on ice with 22:01 and has 11 of his 17 points from the power play. This is where having great defensive depth helps you, as Shea Theodore can step in if Sami does not feel ready. 2/1 – What If The Anaheim Ducks Trade of Corey Perry Pulled Through? 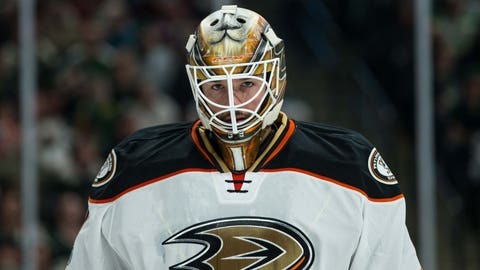 All odds point to Jonathan Bernier for the start tonight. It,of course, would make sense to give Gibson a break, especially on a back-to-back. As much you’re deemed the starter of a team, you don’t want to play so much to the point where your body is broken come play-off time. Bernier’s last start was on January 23rd, where he allowed two goals on 33 shots. If you told me before the season started that Tampa Bay was going to be one of the worst teams in the league, I would not have believed you. Because they are loaded with talent on both ends of the ice. The Lightning were one win away from making the Stanley Cup Final for the second time in a row. Now in this season’s campaign, the Bolts are 3-11 to ring in the new year. Not being able to reap the benefits of your star player when he’s in his prime is a total bummer. He’s 26 and is currently on the IR with an $8.5 million cap hit. He is the NHL’s version of Derrick Rose. It all started in 2013 with a broken tibia when crashing into the net. Then in 2016, he was having nerve damage issues which made him miss the play-offs. The Lightning, however, were able to make it to the Eastern Conference Final without his help. Want your voice heard? Join the Pucks of a Feather team! But after a blistering point per game pace, Stamkos goes down with another injury but this time in the middle of the season. Which proved to be a tough transition because when your star player gets in a groove, it has a gets the rest of your team going. Now with a torn lateral meniscus that has him returning by mid-March, Tampa may not be playing for anything at that point. So I would suggest to shut him down and have him ready for next year. Goaltending in the NHL has produced some interesting storylines lately. Devan Dubnyk went from “how did he even make a roster?” to Vezina heavyweight contender. Then we have “unquestionable No. 1” to “that escalated quickly” in Ben Bishop. Since his sudden drop off the cliff, Bishop seems to be the odd man out. With Andrei Vasilevskiy a young goalie with a lot of upside, moving up the ranks. They may not get much form him in return but that shouldn’t be your main goal. With the expansion draft around the corner, do the trade and protect Vasilevskiy. It is a 4 P.M. puck drop on Prime Ticket and AM 830 KLAA tonight. But for those of you not living in the market, tonight’s game is the free game of the day on NHL.TV.